The Cherokee Casino & Hotel Roland is located off Interstate 40 and U.S. 64 near the Arkansas border just outside Fort Smith, AR. This was the Cherokee Nation's first casino. It began in 1990 as a bingo hall which was converted from a sewing factory. 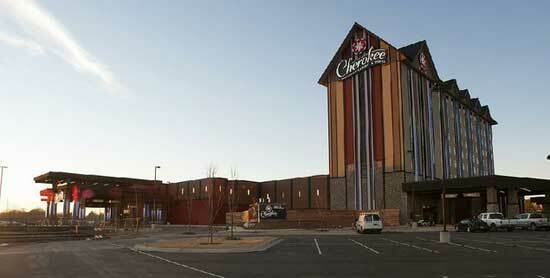 Overtime all Cherokee casinos have been expanded and updated. The Roland casino is the last one to expand. The current Cherokee Casino in Roland opened in July 2015. Cultural theme of earth, wind, fire and water. Must be 21 years of age and have valid photo ID to game or be on the casino floor. The Buffet - Italian, Asian, Mexican selections for lunch and dinner. Grab & Go - Open 24 hours daily for breakfast, lunch and dinner. Six-story hotel with 120 non-smoking rooms including 12 suites.